Hello Bride and Groom's To Be! I’m Ruby the Rochester Bride! As a newlywed of the Rochester area, I love sharing my knowledge of the wedding experience with newly engaged couples. This week I can’t wait to share with you steps in planning your reception! - Determine your budget before you start your planning. - Set your limit to avoid wasting time looking at sites that may not fit your budget. - It is a good idea to leave a cushion to cover unexpected costs. - Estimate the number of guests you expect to attend. - The number of your guests will impact your budget and the location of your reception. - Plan your ideal wedding without leaving anything out, then cut back on the reception to realistically fit your budget and surroundings. 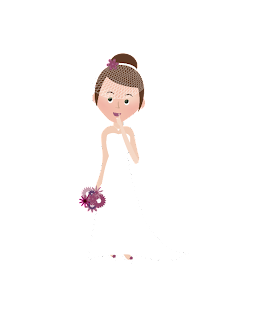 - Most weddings are planned for Saturday with the reception to follow. If you are planning a Saturday wedding at a well-known reception site and/or in a popular month (April through November) book your wedding and reception site as soon as possible. A good rule of thumb is to book your wedding and reception as far as 12 to 24 months in advance. - To increase the chance of having a weekend event, consider a Friday evening, Saturday or Sunday afternoon wedding and reception. > These days tend to be more available with vendors. > Some reception sites offer discounted wedding packages on these days. > Some restaurants will close down for your reception. > If a Friday or Sunday wedding is something you're interested in, check with the ceremony and reception site of your choice to see if this is possible. - Use the experienced staff of a reception site to help you plan an ideal reception. - Your reception site depends upon the location, number of guests, and budget. - Choose a place that can best accommodate the style of your wedding. There are a variety of options: Bed and Breakfasts, Churches or Synagogues, Country Clubs, Historical Mansions, Private Homes, Hotel Banquet Rooms, Outdoor/Gardens, Wineries, Private Dining Rooms in Restaurants. Recommendations: Ask a family/friend for recommendations of locations they have enjoyed. Step 6: Have a ball! Remember, your wedding day is one of the most memorable events of your lifetime. The hard part is over! It is the time for celebration and good times. Forget about the details and make it a day and/or night to remember! Planning a Greater Rochester, NY wedding? I'm here to help! As part of www.RochesterBride.com, I created this Blog to provide you with fun, new, and exciting advice on making your wedding day unique! Copyright © The Greater Rochester Bride and Groom. Watermark theme. Powered by Blogger.